Rabbi will be available for conversion soon! I’m a liberal, post-denominational rabbi who believes that Judaism is relevant, meaningful and inspirational. As the founder of Simcha Services, I support individuals and families in uniquely celebrating Jewish life events. My work is grounded in the belief that every person experiences and expresses Judaism in their own way. My goal is to support you as you navigate your personal Jewish journey. 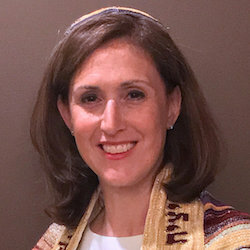 Before being ordained as a rabbi, I served the Boston Jewish community as an educator. Through this work, I discovered the transformative power of Torah study, Jewish ritual, and prayer. I came to understand that we are all teachers and learners who, with open hearts and minds, can access the gifts of our tradition. I would be honored to share your journey to Judaism with you!